A University of Virginia School of Medicine researcher’s pioneering work in childhood cancer has been honored as one of the top 10 clinical research achievements of 2017. Dr. Daniel “Trey” Lee, a pediatric oncologist at UVA’s Children’s Hospital, has been developing a new gene therapy to battle treatment-resistant leukemia in children and young adults. Known as chimeric antigen receptor, or CAR T-cell therapy, the approach genetically modifies a patient’s own immune cells to identify and kill cancer cells. The Clinical Research Forum honored the CAR T-cell project and nine others in April at a dinner at the National Press Club in Washington, D.C. This is the second consecutive year the Clinical Research Forum has honored a UVA Health System researcher. Last year, the group recognized UVA neurosurgeon Dr. Jeff Elias and his colleague Paul Fishman, a neurologist at the University of Maryland, for their pioneering work with focused ultrasound. The Interagency Autism Coordinating Committee selected a research study conducted by autism expert Micah Mazurek, an associate professor at UVA’s Curry School of Education, as one of the 20 most important advances in autism research for 2017. The Interagency Autism Coordinating Committee is a federal panel charged with coordinating federal efforts related to autism and advising the Secretary of Health and Human Services on autism-related issues. In 2013, the Diagnostic and Statistical Manual of Mental Disorders – the official handbook that health care professionals use to guide their diagnoses, including autism – was updated to its fifth edition. In that revision, the diagnostic criteria for autism changed substantially, resulting in considerable controversy. Mazurek’s study used both the fourth and fifth editions of the diagnostic manual to assess 439 children in an effort to better understand the implications of the revision. The study found that the new criteria are somewhat more stringent and precise. There was agreement between versions in most cases; however, children with subtle symptoms were less likely to meet criteria for autism in the new version. Payscale.com, which bills itself as “the world’s largest online salary database,” has named UVA as a top school for business majors in its latest College ROI Report. The report ranks colleges according to the highest return on tuition investment 20 years after graduation. The report offers separate rankings for in- and out-of-state students at public universities. UVA ranked No. 3 in the nation for in-state students, with a 20-year return on investment totaling $947,000; and No. 11 for out-of-staters, with a 20-year return of $831,000. The University of California-Berkeley’s in and out-of-state ratings held the top two spots. The full report is available here. Three faculty members from UVA’s schools of Medicine and Law have been chosen for a yearlong executive leadership program to develop solutions for eliminating racial and ethnic disparities in health care. Dr. Tracey Hoke, chief of quality and performance improvement at UVA Health System. Dr. Cameron Webb, director of health policy and equity at UVA School of Medicine. Dayna Matthew, a professor of law and leader in public health at the UVA School of Law who focuses on racial disparities in health care. Hoke, Webb and Matthew are among 38 people chosen for this year’s program. Now in its 12th year, the Disparities Leadership Program brings together leaders from hospitals, health insurance plans and other health care organizations to address racial and ethnic disparities in health care. The UVA team will develop plans to combat racial disparities in readmission and mortality rates. UVA is just one of 13 organizations nationally selected to participate in this year’s program. 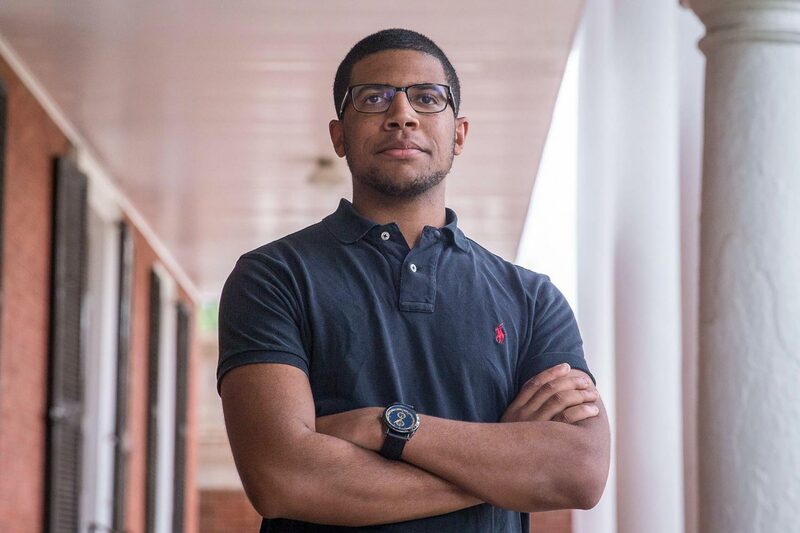 The Harriet Beecher Stowe Center Board of Trustees has named recent UVA graduate Wesley Gobar as one of two recipients of the center’s 2018 Student Stowe Prizes, which recognize outstanding writing that motivates action for positive social change. The Stowe Center will confer the awards Sept. 5 at the Stowe Prize Big Tent Jubilee in Hartford, Connecticut. The winning students – the other is Zyahna Bryant of Charlottesville High School – also will appear at an Action Fair at Hartford’s Immanuel Congregational Church, and as panelists at a free public program there. Gobar, who earned undergraduate degrees in history and government from the University over the weekend, wrote “What It’s Like to Be a Black Student When White Supremacists March in Your College Town,” published on Vox. He described his experiences when white supremacists rallied at the University last summer in response to efforts to remove Confederate statues in Charlottesville. Gobar, a native of Fredericksburg, wrote his undergraduate distinguished history major thesis on the 1887 Thibodaux Massacre, a racial attack in Louisiana. He served as president of the Black Student Alliance, was a peer adviser for incoming African-American students, a member of the Cavalier Marching Band and a member of the Jefferson Literary and Debating Society. He has published work in Vox Media, the Washington Post and The New York Times. Student Stowe Prize winners were selected from dozens of entries received from across the United States. Submissions were reviewed by the Stowe Center’s Teacher Advisory Committee and selected by the Stowe Center Board of Trustees. Recent School of Law graduates George Carotenuto and Megan Keenan are this year’s recipients of the school’s Rosenbloom Award. The annual award was established by Daniel Rosenbloom, a member of the Class of 1954, to honor students with a strong academic record who significantly enhanced the academic experience of other law students by volunteering support and assistance. Carotenuto, of East Hanover, New Jersey, earned a bachelor’s in economics from Duke University. At UVA Law, he was notes editor of the Virginia Law Review, a fellow in the Program in Law and Public Service and a pro bono clinic team leader for UVA Law’s Innocence Project. Carotenuto also served as a research assistant for professors Jason Johnston and Michael Gilbert, and is a class agent for the Law School Foundation. Carotenuto will be a litigation associate at Davis Polk & Wardwell in New York, before clerking for U.S. Judge Madeline Arleo of the District of New Jersey. Keenan, of Steubenville, Ohio, earned a bachelor’s in political science and government from The Ohio State University. At UVA Law, she was president of the Public Interest Law Association and Common Law Grounds. She also served on the Virginia Journal of International Law’s Submissions Review Board and competed in the William Minor Lile Moot Court Competition. Keenan is a member of the Appellate Litigation Clinic and the Civil Rights Litigation Pro Bono Clinic, a Law School partnership with the Legal Aid Justice Center’s Civil Rights and Racial Justice Program. After graduation, Keenan will clerk for Chief Judge R. Guy Cole of the Sixth U.S. Circuit Court of Appeals. Team members from the Charlottesville-based Dementia Care Coordination Program – a partnership between the Memory and Aging Care Clinic at the UVA Health System, the Jefferson Area Board for Aging and the Virginia Department for Aging and Rehabilitative Services – will receive a “Best Practices” award from the Commonwealth Council on Aging for their support of Virginia senior citizens. This program supports seniors who have recently been diagnosed with dementia. After enrollment, a dementia care manager performs an in-home assessment to identify what type of support is needed. The care manager then helps patients and their caregivers get the health care and social services they need. Care managers have provided ongoing, proactive support to more than 100 patients and families, helping them get needed appointments, accompanying them to appointments at the UVA Health System and providing education and support. Andrew C. Dudley, an associate professor of microbiology, immunology and cancer biology in UVA’s School of Medicine, has won an American Association for Cancer Research-Bayer Innovation and Discovery Grant. The highly competitive, one-year, $25,000 grant supports basic, translational and/or clinical research projects that examine important and “druggable” novel targets and/or biomarkers for treating cancer. The grants represent a joint effort to promote the key tenets of the Bayer “Grants4Targets Initiative,” providing new treatment options for cancers with high unmet medical need, encouraging innovation and translation of ideas from basic research into novel drugs, and fostering collaborations between academic groups and the pharmaceutical industry. “Even in microscopic tumors, tumor-associated blood vessels are dysfunctional and leaky, which allows fibrinogen and other plasma proteins to accumulate in a perivascular niche,” Dudley’s research statement says. “Extravascular fibrin creates scaffolds for invasive cancer cells and it forms a lattice for new blood vessels to sprout. Our lab has recently uncovered a vascular-directed and drug-accessible pathway that controls the rate of fibrin degradation and tumor progression,” which may be exploited as a treatment option. 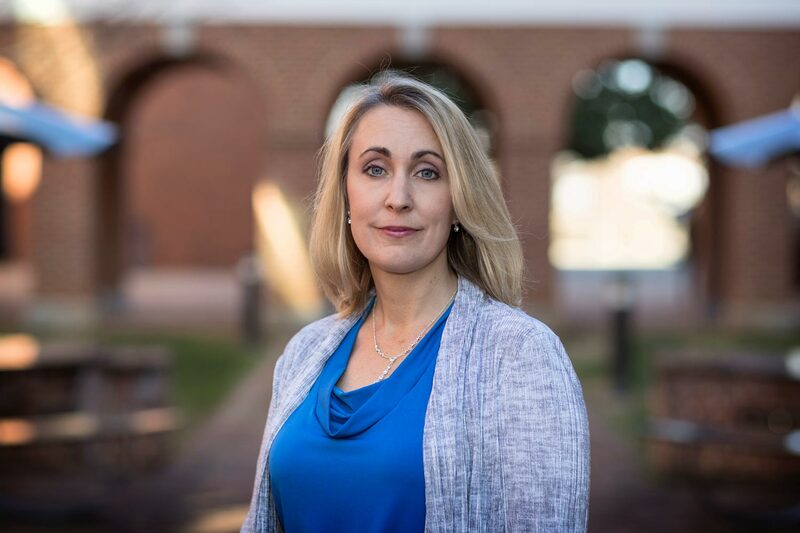 The College and University Professional Association for Human Resources has given its national HR Excellence Award to Kelley Stuck, UVA’s vice president and chief human resources officer. Stuck, who came to work at the University in 2016, is leading an overhaul of the University’s human resources systems. The Ufirst initiative seeks to create a customer-centric human resources function and make the employee experience exceptional. Ufirst will enhance UVA’s human resources systems in types of services, quality and staffing among central human resources and schools and units. Ufirst takes a holistic, strategic view across UVA, including the entire Academic Division and Health System. Stuck will receive the award Oct. 8 at the association’s annual meeting in Indianapolis. The University will receive a $3,000 contribution to either its endowment or a scholarship fund of Stuck’s choice. The American Constitution Society for Law and Policy at the UVA School of Law has been named student chapter of the year. The national American Constitution Society presents the annual award to the chapter that has shown the greatest strength in meeting the society’s mission and goals. The organization lauded UVA Law’s chapter for initiatives on issues such as immigration, equality, the First Amendment and criminal justice. Other topics have been in response to the Trump administration’s policies, such as the travel ban and the intersection of LGBT and religious rights. “I am proud of the work of the organization and our chapter, and look forward to seeing ACS and the progressive community at UVA Law continue to grow stronger,” said outgoing chapter President Ryan Snow, who graduated Sunday. The society also cited the chapter for facilitating connections in the UVA Law community and co-sponsoring a faculty panel to discuss issues surrounding August’s white nationalist rallies. Snow said the chapter has prioritized collaborating with affinity groups and other progressive student organizations in co-sponsoring and co-promoting events on legal and policy issues, as well as social events such as an annual Law for Progress barbecue mixer. Additionally, the chapter began a local partnership with Spread the Vote and The Haven, a Charlottesville day shelter for the homeless, to help residents get IDs. The chapter also received the Programming Award, given to ACS chapters that have conducted at least 20 substantive and compelling events during the school year. The chapter will be honored in June at the ACS National Convention in Washington, D.C. The American Academy in Berlin has selected UVA politics professor Herman Mark Schwartz as one of two dozen U.S. recipients of its 2018 Berlin Prizes. The semester-long fellowship will allow Schwartz to spend spring 2019 researching the economic reasons behind increased ethno-nationalist, anti-immigrant, anti-system parties in wealthy Organization for Economic Cooperation and Development countries. The Berlin Prize is awarded annually to scholars, writers, composers and artists from the United States who represent the highest standards of excellence in their fields. Fellows receive a monthly stipend, partial board and accommodations at the academy’s lakeside Hans Arnhold Center in Berlin-Wannsee, Germany. The prize provides recipients with the time and resources to step back from their daily obligations to work on academic and artistic projects they might not otherwise pursue. Fellows are encouraged to work with local individuals and institutions in the academy’s well-established network, forging rich connections and lasting transatlantic relationships. UVA School of Nursing associate professor Ishan Williams was elected president of the Southern Gerontological Society at its annual conference in April. Williams, who assumes the presidency in 2019 for a two-year term, studies quality-of-life issues affecting older adults and their caregivers, with a particular focus on vulnerable and minority populations. Currently, she’s working in research examining dementia, disease management for elderly people with Type-2 diabetes, and the link between cognition and vascular problems among African-American adults. Williams is a fellow of the Gerontological Society of America, the nation’s largest interdisciplinary organization devoted to aging, and serves on its board. She also serves on the AARP’s Public Policy Institute Roundtable and the Lindsay Institute’s Caregiving Advisory Council, and is associate editor for the Journal of Ethnicity & Health. 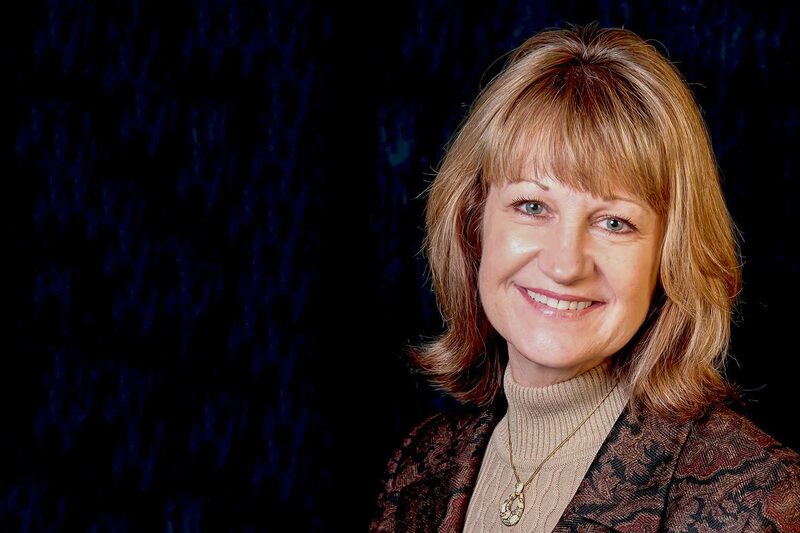 Susan Kools, associate dean for diversity and inclusion in the School of Nursing, is the 2018 recipient of her alma mater’s Helen Nahm Research Award, bestowed annually at the University of California, San Francisco. Kools will be feted in San Francisco at the end of May. Prior to arriving at UVA, Kools’ research took her around the world to study the challenges of children in foster care, as well as adolescent health and development. At UCSF, she was an original member of the school’s Diversity in Action Committee, which drove its efforts to diversify and engage in dialogue about race, ethnicity and diversity of viewpoints. 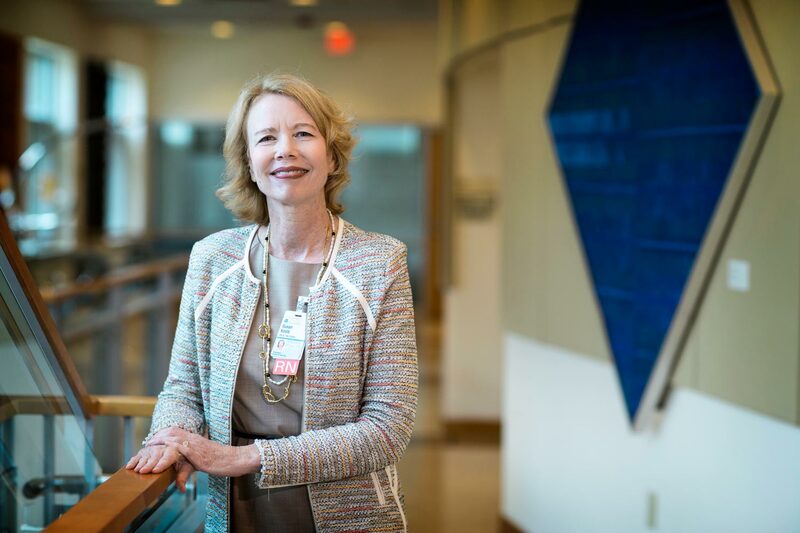 At UVA, the spirit of that work continues, and her work has insured that UVA’s nurses are as diverse and culturally competent as the patients and families they serve.